Miss Berry writes to Mr. Jackson explaining that Mr. Ford gave buildings at the Girls' Schools but had nothing to do with her personal home. She encloses an article from the Rome paper who refuses to refute the article even though it's incorrect. She asks Mr. Jackson to write an article for the Atlanta paper stating the truth about the Fords and their help at The Berry Schools. 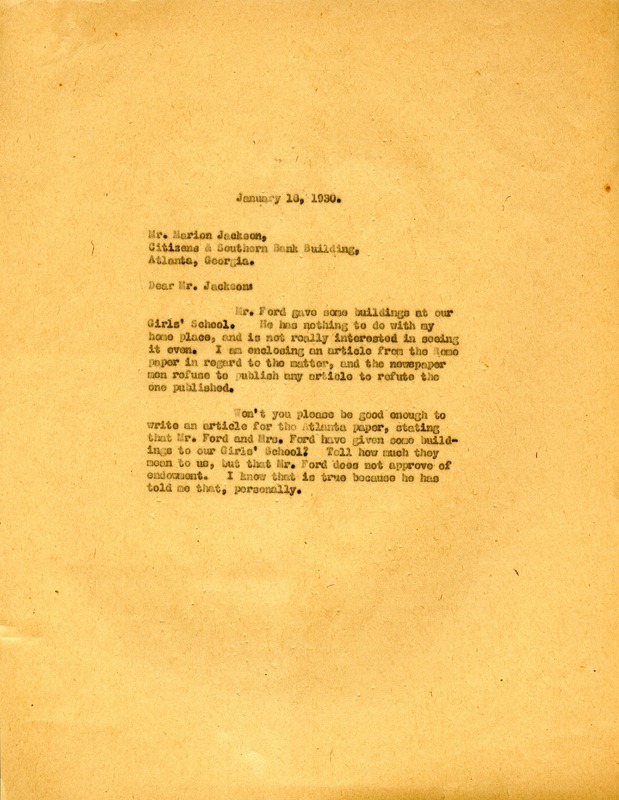 Martha Berry, “Letter to Marion Jackson from Martha Berry.” Martha Berry Digital Archive. Eds. Schlitz, Stephanie A., Chelsea Risley, Meg Ratliff, et al. Mount Berry: Berry College, 2013. accessed April 21, 2019, https://mbda.berry.edu/items/show/12970.